Recently, Nutritionist and Cheer Up Buttercups Co-founder, Allison Reyna, was asked by Time Warner Cable to do a short segment on healthy snacks that kids will love. 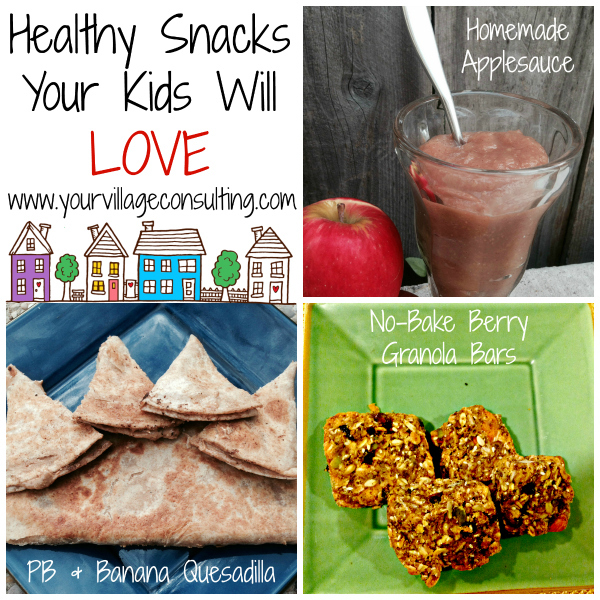 Having tested these recipes on her three children, we can honestly say that these are snacks your kids really will love! Whether they need a power snack in the morning, or an after-school snack to curb their appetite until dinner, your kids will approve of these choices. 8 apples of your choice, depending on how sweet you want the applesauce. Peel and cut apples into chunks, and add them to the crockpot. Squeeze half a lemon over the top of the apples and add the water. Sprinkle the cinnamon over the top and stir the apples. Cook the apples on high for about 4 hours or until the apples are soft. Once cooked, use a blender or hand blender until the apples form a sauce. You may need to add a little bit of water if it is too thick. Spread pb on half of tortilla. Top with sliced bananas (and chocolate chips if using). Spread other half with just peanut butter so the tortilla sticks together. Melt butter or ghee in a pan on medium-low heat. Place tortilla in the pan, and then flip the tortilla once it starts to brown. Let it cool off, cut and enjoy! Line an 8″x 8″ baking pan with parchment or wax paper allowing the paper to hang over the edges for easier removal when finished. Combine the oats, nuts, and dried fruit in a large bowl and mix to combine. Add maple syrup or honey and apple sauce and mix to combine. Add peanut or almond butter to mixture and mix until combined. Place mixture in prepared pan. Place pan in freezer for at least 1 hour. Remove pan from freezer and cut evenly. Store in airtight container in fridge or freezer so you always have a healthy, nutritious treat on hand. Don’t forget to check out our Time Warner Cable segment for other quick snacks!